Khara establish a new company presumably named "Studio Project Q"
Google Translate wrote: I think that there is no such thing as something that makes sense, so please feel free to visit. .
Re: Khara establish a new company presumably named "Studio Project Q"
From what can be elucidated in Google Translate, it'll be mostly centered around CG animation. 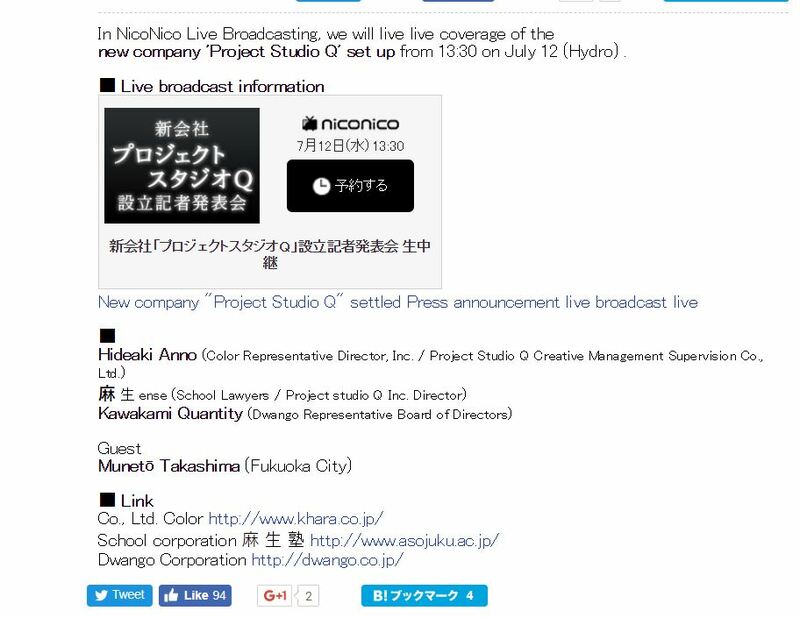 The following comes from Studio Project Q's website. Due to this relationship, together with Mr. Aso and Mr. Dwango, we decided to set up a human resource development plan mainly for CG animation. Thanks to these three company projects, we are fortunate to contribute to the local industry as much as possible, make the best use of human resources, help the animation CG industry even a little and push forward the quality of the work a bit. Animation is a culture Japan is proud of worldwide. However, in the trend of global digitization, establishment of Japanese-like CG animation methods is still to come. The age of the net, the age of digital, the age where works can be made anywhere. I am expecting the success of Studio Q born in the land of Fukuoka. In the place called Kyushu, we established a company working on top-line work with top creators of the industry. I hope that it will become a new choice for many creators and those who are aiming for creators. From Kyushu we will cultivate talented personnel who will be responsible for the animation / CG industry, and we will strive to contribute to further leap in the industry. So the first project from SPQ will be Shin Eva. Not a surprise. Google Translate wrote: We are recruiting widely talented people including Shin Eva who is currently producing. Please take a look at the studio Q recruitment information! Zeruss wrote: From what can be elucidated in Google Translate, it'll be mostly centered around CG animation. This was planned to be achieved by attracting new talent at its own origin; within the education system. By way of an early specialisation this may commend further interest on developing even more characteristic skills particular to the animation medium, and subsequently foment its (needed) retention. So, in the end, this studio seems to me more like a 'training camp' where it will be handled some production assistance tasks for the main team. Second wave of recruitments just started, deadline at the end of the 2018 fiscal year. No mention of projects.